Osaka, Japan - Panasonic Corporation announced today that it has developed a drowsiness-control technology for detecting and predicting a person's level of drowsiness and allowing to stay comfortably awake. This technology, which can help prevent drowsy driving, detects a driver's shallow drowsiness1 at the initial state by accurately measuring the driver's states without physical contact, including blinking features and facial expressions, etc. captured by an in-vehicle camera, and processing these signals using artificial intelligence. 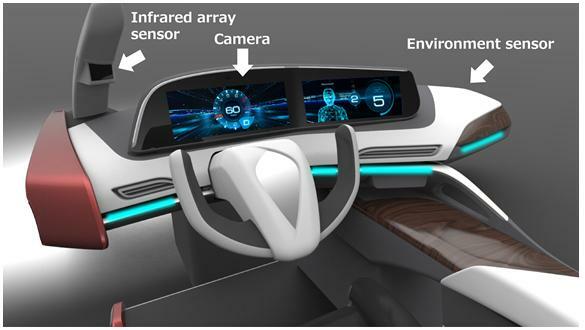 Further, using measurement data from the in-vehicle environment, such as heat loss from the driver and illuminance, Panasonic's new technology also predicts transitions in the driver's drowsiness level. The technology also combines thermal sensation monitoring function, allowing the driver to stay comfortably awake while driving. This technology has made it possible to develop a driver-monitoring system that detects the driver's current level of drowsiness and predicts transitions in the driver's drowsiness based on the in vehicle environment, as well as a drowsiness-control system that allows the driver to stay comfortably awake. These systems prevent the driver from falling asleep while driving. Samples will be available from October 2017. The system extracts an outline of the eyes (shown in the photo below) and monitors time-sequence shifts in blinking features by checking the opening between the eyelids (shown in the graphs below). Panasonic has conducted joint research with Chiba University, which revealed that heat loss from a person's body is correlated with the person's drowsiness after prescribed time elapses, regardless of how much clothes the person wears. Panasonic has also developed a contactless technology to measure heat loss from a person's body with the company's original infrared array sensor Grid-EYE . In addition, the company has identified the effect of the elapsed time and the surrounding brightness, which is measured by an environment sensor, on a person's level of drowsiness. Source: Hiroki Kitajima, Nakaho Numata, Keiichi Yamamoto, Yoshihiro Goi: "Prediction of Automobile Driver sleepiness (1st Report, Rating of Sleepiness Based on Facial Expression and Examination of Effective Predictor Indexes of Sleepiness)," Transactions of the Japan Society of Mechanical Engineers (C edition), Vol. 63, No. 613, pp. 93-100, 1997. The infrared array sensor carries two-dimensionally arranged pixels that detect infrared rays (wavelength: 10 µm) emitted from a human body or object. It is capable of measuring a two-dimensional temperature distribution. Panasonic's infrared array sensor Grid-EYE has 64 pixels. Equipped with a super-resolution algorithm and can be swung with appropriate speed and an angle, thus offering clear thermal images equivalent in resolution to images created with about 7,800 pixels.